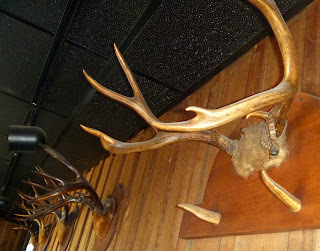 Antlers is a classic, rustic diner and neighborhood tavern in the small town of Twisp, Washington. It's the sort of place that depends somewhat on tourists that come to hike and ski and bike and visit old west Winthrop up the highway. But it is still dominated by the locals, seasonal or year round, enough so that an old couple were manifestly miffed that they were served by a new gal, who didn't know the nuances of their order. I was told that in the winter it is so slow that the cooks will see regulars coming down the road and start cooking their meals before they arrive. 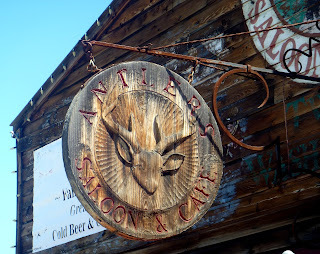 Antlers is quite old, and the menu tells a bit about its colorful past. I chatted with regular Jim, who told me his mother was a bartender during one incident mentioned on the menu which resulted in bullet holes that can still be seen in one of the many taxidermy deer heads on the wall. Both versions describe a regular who used to always come in packing his .38, and was a bit hooched up one particular night in the 1950s. 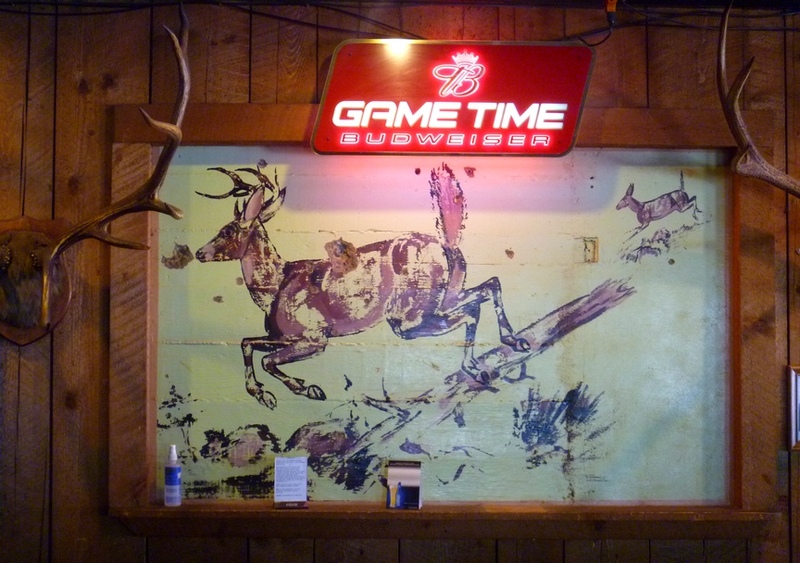 Jim says that the menu version leaves out that the owner was well lubricated himself, and it was he that challenged the customer to a contest shooting at the deer in the mural across the room. 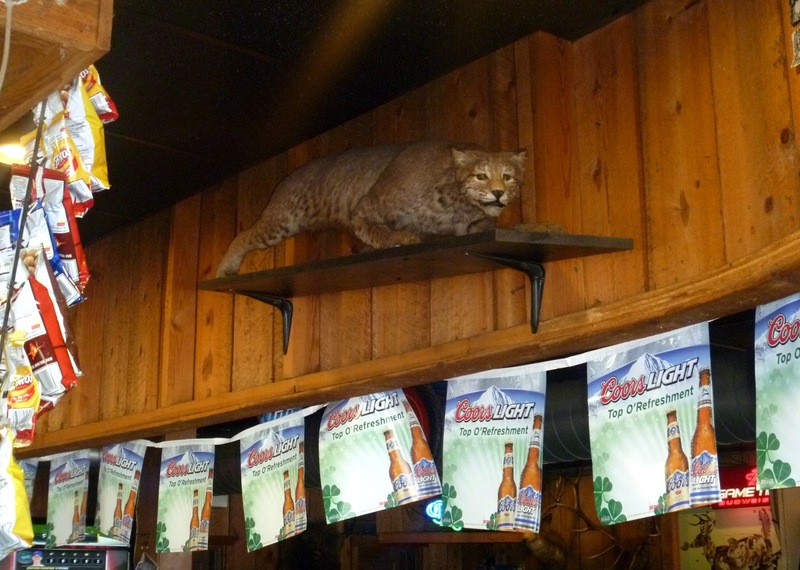 Jim said his mother told him that the way bullets were ricocheting around the room it was a wonder none of the humans ended up sharing the fate of the former denizens of the surrounding hills whose heads now adorn the walls. 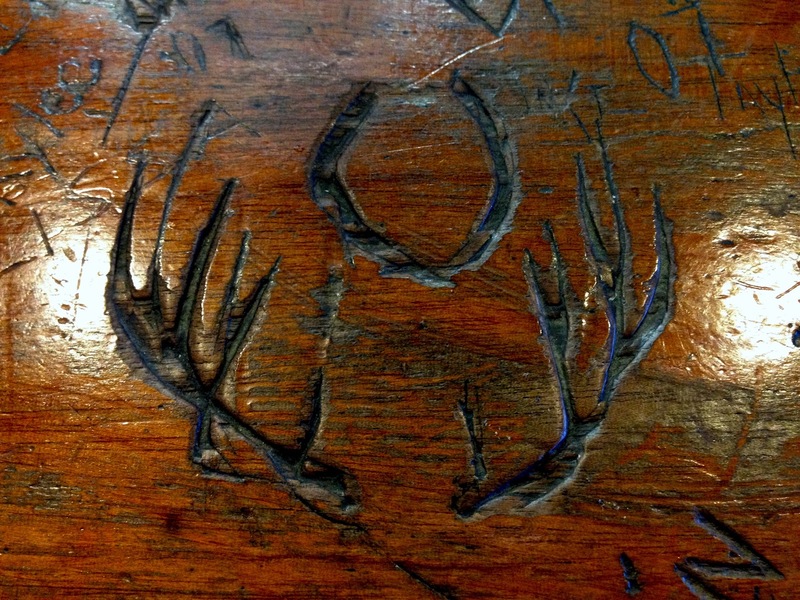 I'm do not know the exact age of Antlers, but there is a picture on the wall that is labeled as Antlers in 1914. This would not have been the current building, which was constructed after a fire burned down 23 of the 25 buildings in the Twisp business district in April 1924. The current structure appears to have been built shortly after that, the first one constructed after the fire, and one assumes that it returned to being a (legal) bar soon after prohibition ended, i.e. in late 1933 or early 1934. A photograph of Antlers in 1936 makes it plain that if the current location is based on that same building, it has been fairly dramatically remodeled and expanded. 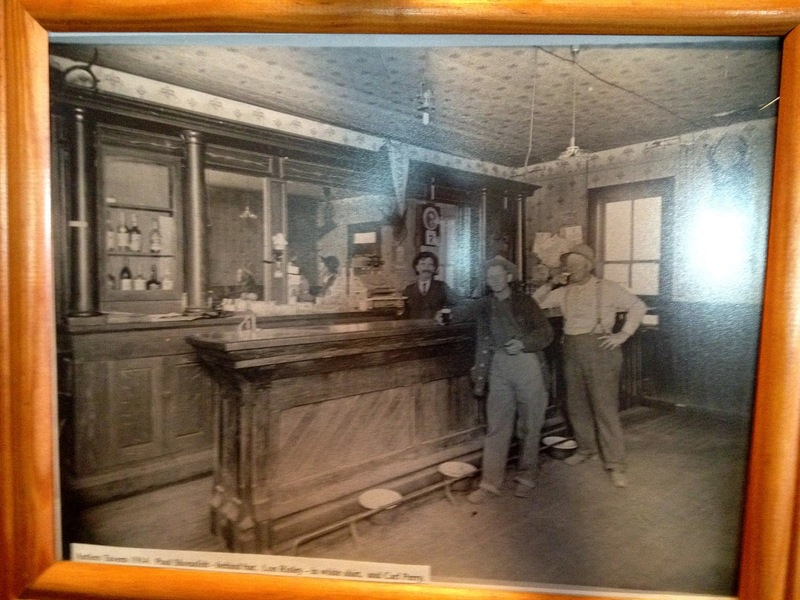 The name was changed to "Antlers Cafe" in 1936, then "Antlers Tavern" in 1940, and "Antlers Saloon and Cafe" in 1996. Some of the trophies on the wall are over 100 years old. 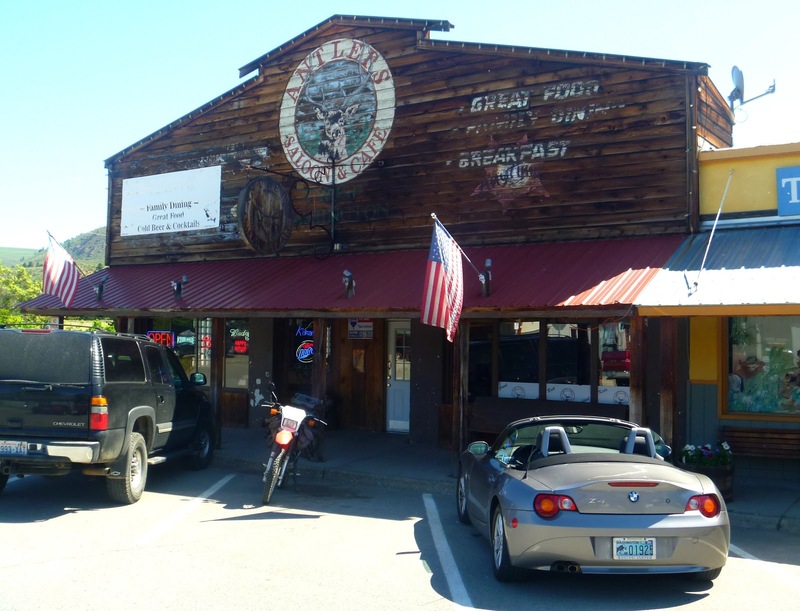 The town was originally established in 1897 as "Gloversville," after mineral discoveries up the Twisp River Valley. Re. "Twisp," according to HistoryLink, "Despite persistent explanations of the meaning of the name -- that it is a Native American word for wasp or yellow jacket, or the sound made by a wasp -- the origin of the name Twisp is not known." 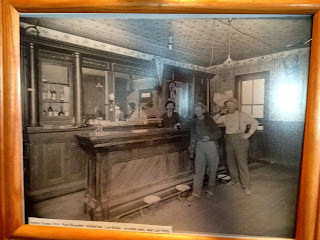 Like most communities across the U.S., Twisp residents considered prohibition laws well before federal prohibition and Washington State prohibition (Jan 1, 1916). Thankfully those days are long gone and I could openly enjoy my gin and tonic as I we chatted with Jim and took in the horns and heads. Bar Est. 1933? - Building constructed: 1924? The Antlers original liquor license I read somewhere was the 2nd issued by the State, the1st being issued to a bar in Roslyn,WA. Eph Davis my ancestor owned the saloon/bar for a number of years and bagged most of the trophy heads and Antlers hanging in bar.